Recent advances in computational power are currently enabling the use of probabilistic simulation modeling and other quantitative techniques in the sub-disciplines of natural hazards, allowing assessments of uncertainty that may not have been possible in the past. This volume proposes to examine state-of-the-science techniques in much greater depth than previous volumes. Studies from various continents will be presented highlighting the global relevance of this work in mitigating hazards to human life and other natural and socioeconomic values-at-risk. One expected outcome of the volume among many is in assembling studies across types of natural hazards that will illuminate methodologies that currently cross sub-disciplines, and identify possibilities for novel applications of current methodologies. Due to the in-depth examination of six types of natural hazards, the volume will appeal to members of each sub-discipline who might not normally purchase a general volume on natural hazards. This volume is an outcome of the 2013 AGU Fall session ‘Uncertainty in Natural Hazard Assessment: Volcanoes, Earthquakes, Wildfires, and Weather Phenomena’, which was a combination of two AGU Focus Group Sections, Natural Hazards and Volcanology/Geochemistry/Petrology. In the session, researchers from volcanology, wildfire, landslide analysis and other fields were brought together to compare results in characterizing uncertainties and properly developing three- and four-dimensional understanding of event probability. The proposed AGU volume will focus on the work presented at this session as well as other presentations from across the 2013 AGU Fall meeting that had a focus associated with the AGU SWIRL theme, ‘Characterizing Uncertainty.’ The volume will have several central themes associated with the different disciplines represented in the session and from across AGU, as well as a clear description of what is meant by ‘uncertainties/probabilities associated with natural hazards’. For the chapters and sections of the book, special emphasis will be laid on emergent themes for techniques and perspectives that span the range of natural hazards studied. A concluding chapter will review modeling approaches discussed, lessons learned, and similarities and differences across uncertainty characterization methodologies. An important goal of this chapter is to point out that natural hazard sciences may vary across multiple dimensions: data availability, sufficiency, and spatiotemporal scale; the relative amount and cumulative expertise of scientists working in each field; and the state-of-the-art in quantitative uncertainty assessment. Synthesis of these similarities and differences could highlight important synergies and opportunities for cross-hazard collaboration and learning. The proposed volume will be unique in that it will bring together scientists from across the full breath of the AGU scientific community, from those in real-time analysis of natural hazards, to those in the research community from academic professors to graduate students. 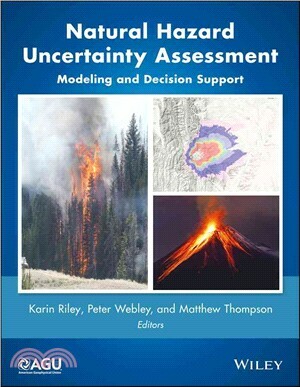 This book will therefore be an excellent resource for those interested in current work on uncertainty classification/quantification, as well as provide documentation of the common themes that cross disciplines, to allow all in the AGU and natural hazards communities to learn from each other and build a more-connected network. Dr. Karin Riley is a Research Scientist in the Numerical Terradynamic Simulation Group in the University of Montana, Missoula, Montana. Her research interest focuses on the calculation of risk to terrestrial carbon stocks and expected emissions for the continental US, tree-level spatial model for the continental US, modeling of change in burn probabilities under climate change, and validation of FSim Large Fire Simulator’s national burn probability and flame length outputs. Dr. Peter Webley is the Research Assistant Professor at the Geophysical Institute in the University of Alaska Fairbanks. His research interests lie in volcanic ash cloud and plume detection through thermal and visible remote sensing as well as volcanic ash cloud modeling using Lagrangian transport and dispersion models. Given his background in thermal and radar based remote sensing, he also has an interest in real-time detection of ground based volcanic activity through remote sensing datasets and how to sue these for hazard assessment and risk mitigation. Through his research projects and collaborations, Dr Webley works closely on with both groups across UAF as well as further afield in the USGS, NASA, NSF, State University of New York - Buffalo, Michigan Technology University. Within the University of Alaska Fairbanks, Dr Webley is the UAF Faculty Senate Research Advisory Committee co-chair as well yearly he provides an instructional two-week module for the Alaska Summer Research Academy. Outside Alaska, Dr Webley is the America's and Caribbean chair for the World Organization of Volcano Observatories and on the Steering Committee of the Global Volcano model project. Dr. Matthew Thompson is a Research Forester at the USFS Rocky Mountain Research Station in Missoula, MT. His research interest lies in application of principles from systems engineering, industrial engineering, risk analysis, operations research, economics, and decision-making under uncertainty to complex resource management with economic and environmental objectives.